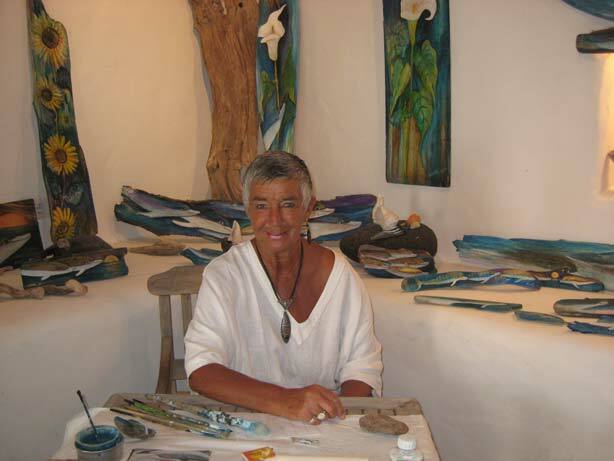 My gallery is situated in the centre of Teguise the old capital town of Lanzarote. One enters the old finca through the main entrance of the house; passing into the picturesque internal court yard with grape vines and flowers. At the far end of the patio is the entrance to my Galeria which was originally the old kitchen; with a wide chimney breast and white washed walls; ideal for displaying my work. The old flagged floor and uneven texture of the walls gives a rustic effect - in keeping with the wood I paint on. Visitors seem to appreciate the tranquil candle lit atmosphere as they find themselves surrounded by Dolphins and fish; sun flowers and lilies and the occasional scene that captures my imagination. The people give me a lot of joy as I notice the expression of pleasure on their faces. Many return to visit me year after year. I am now proud to present my book that I have written and illustrated "Suzette und das Gluck der Delfine", published by arsEdition Munich, photograghy by Anne Schackman. Eleven short stories with a message for life - including some of my wonderful encounters with wild Dolphins and Whales. I am very soon narrating my stories on cd in English for those that would like to hear them. Looking forward to meeting you in my Galeria.